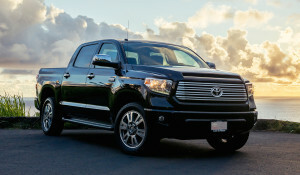 Already able to provide more than five tons of pulling power, along with dedicated models for off-road enthusiasts and luxury lovers alike, the 2016 Toyota Tundra has been fine-tuned to appeal to even more pickup customers. For example, because modernized multimedia resources are a must-have, even in the full-size pickup segment, the 2016 Toyota Tundra family has been updated to the latest Entune version 2.5 technology. Highlights include a standard 6.1-inch touchscreen, rearview camera, USB 2.0 port with iPod support, advanced voice recognition, Bluetooth connectivity for hands-free calling and audio streaming, and more, and there are more upgrades for up-range trims: A new mid-range Entune setup also debuts, boasting a “Hi-Res” 7-inch touchscreen and the Connected Navigation Scout GPS Link App, while the most premium package offers integrated navigation, Toyota’s smartphone-enabled app-access feature, and 12-speaker JBL audio. Toyota additionally deployed a new, larger fuel tank for those uplevel Tundra models, increasing capacity 44 percent, to 38 gallons, and extending travel range to more than 600 miles, depending on engine choice. Speaking of which, the Tundra’s powertrain menu serves up a pair of robust V-8 engines, both of which have a serious appetite for action. The standard motivator makes 310 horsepower and 327 lb.-ft. of torque from its 4.6 liters of displacement, backed by a six-speed automatic transmission and technologies like dual independent variable valve timing. Then there’s the Tundra’s 5.7-liter V-8, which ups outputs to 381 horsepower and 401 lb.-ft. of torque. It’s enough for a trailering maximum of 10,500 lbs., bolstered by a standard bundle of performance enhancers just for towing. Among them: an integrated trailer-brake controller, a “tow/haul” mode for its six-speed automatic, and trailer-sway control. Of course, just as important to pickup owners is the bed of the vehicle, so Toyota supplies three different box lengths for the Tundra, from 5.5 feet to 8.1 feet, paired with a payload rating that can reach 2,060 lbs. A lockable, easy to handle tailgate, as well as a handy deck-rail cargo-management system, also add to the truck’s overall versatility. But as mentioned, the Tundra also caters to owners with more specialized preferences. Thus, the automaker’s TRD motorsports experts have developed off-road packages for the Tundra SR5, Limited and range-topping 1794 trims, and put it all together in the 2016 Toyota Tundra TRD Pro. In that configuration, the Tundra wears trail-friendly gear like an aluminum skid plate, Michelin off-road rubber, and a TRD suspension complete with Bilstein hi-po shock absorbers. Drivers with an eye for premium pickups can take a look at the 1794 Edition, which pays homage to the Tundra’s Texan roots: All Tundra models are built at Toyota’s truck facility in San Antonio, on the same grounds that still house the “1794 Ranch,“ which, in turn, honors its founding date in its own name. That long Lone Star history is reflected in the 1794 Edition’s Western-themed ultra-lux appointments, and especially its saddle-brown premium-leather seating and embossed leather accents.